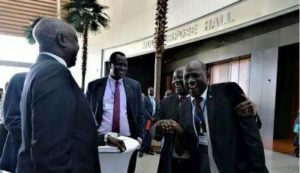 South Sudanese government has ended a boycott after mediators on Tuesday accepted the participation of its entire delegation in the revitalization forum without cutting the number of representatives dispatched to the venue of the talks. “Our delegation is participating in the talks as it came from Juba,” said Buay, an adviser to the chief negotiator. The official did not elaborate on the circumstances under which the delegation was first rejected and what prompted their acceptance by the mediation. The Second Phase of High-Level Revitalization Forum begun on Monday without the government delegation after the refusal of the mediation team to accept the whole delegation pointing it should be limited to 12 members. THe South Sudanese officials insisted that their delegation include a number of advisors and experts needed to tackle a number of issues debated in the forum. establishment of separate camps for cantonment of the government and opposition armed forces. In line with the peace deal, the measure aimed to enable personnel, weapons and equipment accountability, screening, disarmament and demobilization. But President Salva Kiir, during his participation at the African Union summit in Addis Ababa by the end of January told the IGAD leaders that this disposition was one of the causes that led to the armed clashes between the government troops and SPLA-IO Machar forces in July 2016. The spokesman of the government delegation, Michael Makuei Lueth said in a press briefing after the break that the government would not accept any proposal bringing up the two army system issue. “Our chief negotiator made it very clear that there are two things that are untouchable. Issues of governance, we are not here to tempter with provisions that are not affected by the resolution of the IGAD council of ministers,” said Minister Michael Makuei Lueth. Speaking through state-owned South Sudan Broadcasting Corporation, Minister Lueth said the idea of two armies in one country was also out of question. “We will not talk even about it,” he adds.